Books have always been a part of the holidays for me. They often made up the bulk of the gifts I received. They often made up the bulk of gifts I gave. Plus, they were also how I spent these quieter days. Page after page turning in that quiet whisper of paper and breath. So today, I bring you my favorite holiday books. While they are all Christmas books – Christmas is the holiday my family celebrates – I am calling them “holiday” books for two reasons. First, they honor elements of this time of year that people – no matter their tradition or faith – celebrate – love, honor, sacrifice, and hope. Secondly, I would have books from other faiths on this if I knew them, but sadly, I do not. Maybe you can broaden my knowledge by suggesting your favorite holiday books for me. 5. The Night Before Christmas by Clement C. Moore. I love the simplicity of the story, the rhythm of the language, the way the poem has slipped into our collective conscious. If you’re getting a copy, pick one with your favorite illustrations. Those are key. 4. A Child’s Christmas in Wales by Dylan Thomas Christmas in Britain somehow seems to sum up Christmas for me. If you pick this one up, be sure you get a version that includes Thomas reading the story in his resonate, Welsh voice. 3. 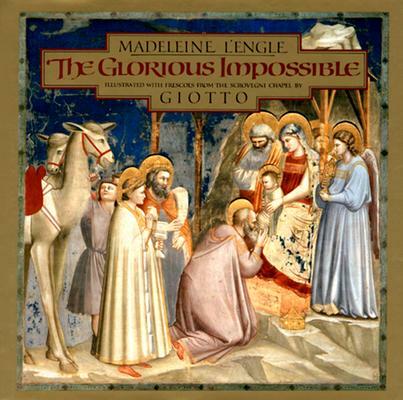 The Glorious Impossible by Madeline L’Engle. This story gifts us with the reminder that all about us is the possibility of miracle. 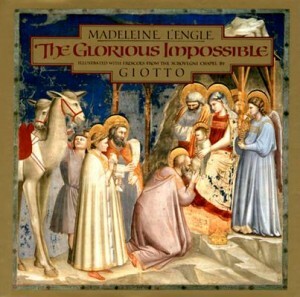 The illustratations are taken from frescoes by Giotto, and as a teenage, they were my first images from Renaissance art. They shape my love for it, even now. 2. 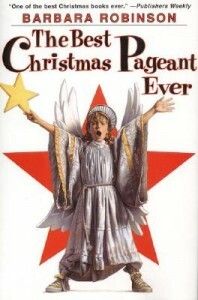 The Best Christmas Pageant Ever by Barbara Robinson. This was my mom’s favorite Christmas book. She loved the way people were shown grace, the way even the most hopeless people found hope, and the way that we are given gifts in the most unexpected, ironic ways. To see glory with our own eyes. To see Word become human. What more could this writer, this woman want? The miracle of Christmas. What is your favorite holiday book? Please share yours, and on New Year’s Day, I’ll select a random commenter to receive a copy of The Best Christmas Pageant Ever in honor of my mom and in honor of you. Happy Holidays, All. And if today, you and I celebrate the birth of a baby together, Merry Christmas as well.